WX102 DAQ32Plus | Yokogawa United Kingdom Ltd.
With this software, you can freely allocate up to 32 measurement and computation channels and define a maximum of 30 channel groups. By opening multiple windows, you can monitor data simultaneously on multiple channels. The monitor manager is used to start and stop logging, and to keep track of monitor group settings. The individual monitor windows are launched from the monitor manager. The alarm overview displays alarm statuses group by group. The alarms for all groups can be viewed at the same time so that you won't miss any alarms. Level meters, analog meters, and thermometers can be set as desired on each channel to create an effective monitor screen. Current values are displayed without modification in this area. This display is useful for acquiring detailed information when a problem occurs. This display presents measurement and computation value as analog trend. It can also "play back" the most recent 1800 data points. The color monitor display allows measurements to be color-coded using as many as fifty color gradations from red to blue. This feature is useful for gaining a visual sense of temperature trends and making visual comparisons of measurements taken on multiple channels. 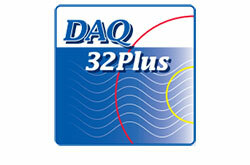 DAQ32 Plus allows multiple window display of historical data from DC100 and DR recorders floppy disks or PC hard drives. This data can be displayed in a variety of forms, such as analog trend, digital values, and alarm logs. The analog trend display feature allows you to display up to 30 windows of channel data each containing as many as 32 channels. You can switch between the windows one at a time, and the color monitor display can also be used simultaneously. Displays statistical computations for the data between the cursors. Historical data can be converted to Lotus 1-2-3(version 1A is supported), Excel(version 4 is supported), and ASCII formats. The digital value display feature allows you to display up to 30 windows of data each containing as many as 32 channels. You can switch between the windows one at a time. Displayed information can also be output to a color printer. This software configurations the DA100, DC100, and DR Series. Configurations can be uploaded/downloaded between DARWIN and your PC, including measurement ranges, measurement cycles, measurement start times, alarms, events/actions, and formulas. Settings can be stored on your PC's hard drive or a floppy disk for reuse. The setting screens use easy to view table formats. You can also graphically display the system configuration, including modules installed in DARWIN, and reconfigure the system as necessary when you change the modules installed in the DA100, DC100, or DR Series (expandable model). This software can also be used to calibrate DARWIN input modules. There are two types of tags: TAG NOs, which can be entered as up to 8 standard-width characters; and TAG COMMENTs, which can be entered as up to 16 standard-width characters. Tags can be displayed instead of channel numbers in the data logging software or the viewer software. With the DC100 and DR series, tags set using keys on the main unit can be loaded in the tag setting software, and tags set in the software can be sent to the main unit. DAQ32Plus Client is client software designed to remotely access the monitor server of DAQ32Plus installed in the server PC on an Ethernet. Simultaneous remote access is possible from a maximum of 8 client PCs on the Ethernet to the DAQ32Plus monitor server of the server PC. In addition, simultaneous access can be made from a separate remote monitoring software component to a maximum of 8 monitor servers for remote monitoring. Note that the remote monitors for DAQLOGGER Client, DAQ32Plus and DAQ32Plus Client, and data monitor for DAQEXPLORER cannot be used at the same time on the same PC. The multi-logging of 32 channels x 50 groups is avaialble by groups in combination with Addmulti. The event logging with advanced trigger conditions is available in combination with AddTrigger. User-created screens offer convenient monitoring in real time in combination with AddObserver and AddObserver Runtime.